A Hawaii agency’s decision to let San Diego-based developer OliverMcMillan proceed with its Symphony Honolulu condominium tower without making changes to the building’s glass curtain came down to a standard it could not defend, the agency board’s chief told PBN. The HCDA, which regulates development in Kakaako, reached a $1 million settlement this week with OliverMcMillan over the agency’s existing “glass rule” for its Symphony Honolulu condo tower, which is being built at the corner of Kapiolani Boulevard and Ward Avenue across from the Neal S. Blaisdell Center. The building has a completion date scheduled for March 2016. The glass rule requires that current condo projects in Kakaako have a measured visible light transmission level of at least 50 percent, but the glass installed on the Symphony project has a visible light transmission level of less than 50 percent, which has prompted testimony about glare. OliverMcMillan accepted the state agency’s decision, agreeing to add $1 million to its existing public facilities dedication fee, which now stands at $3.6 million. The HCDA also ruled that OliverMcMillan must reimburse the state agency for $24,000 in consulting services and pay a $2,000 fine for failing to correct the violation. He admits that the glass rule is a procedural and regulatory issue that needs to be addressed. Next month, the HCDA will hold public hearings to address a glass issue for another Kakaako condo, which was developed by Downtown Capital LLC. However, Whalen pointed out that the circumstances dealing with the 801 South St. affordable condo project are somewhat different from the Symphony project, mainly because the glass windows are much smaller at 801 South St.
“It’s [still] non-compliance of a standard,” he said. 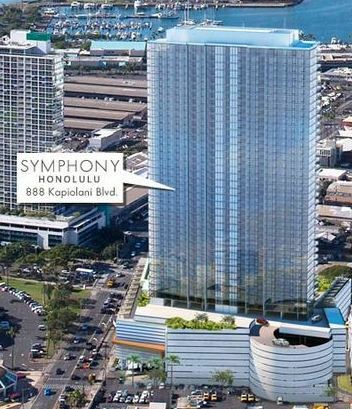 This rendering shows the Symphony Honolulu condominium, which is being developed by San Diego-based OliverMcMillan. OliverMcMillan has purchased the little more than three-acre parcel across from the Neal S. Blaisdell Center where the San Diego-based developer is currently building the Symphony Honolulu luxury condominium tower, according to public records. OliverMcMillan, which formed Honolulu-based OliverMcMillan Pacific Rim LLC, paid JN Group Inc. and Casti Family LP $26 million for the property at 888 Kapiolani Blvd. The sale closed on July 30. 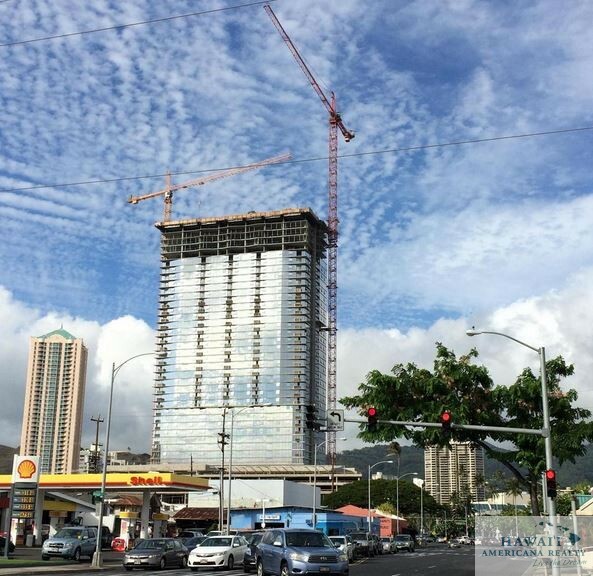 The 388-unit, 45-story Symphony Honolulu project, which is under construction at the corner of Ward Avenue and Kapiolani Boulevard and is expected to be completed in less than a year, gained headlines recently regarding an issue dealing with its glass windows. The Hawaii Community Development Authority, which regulates development in the Honolulu neighborhood of Kakaako, is deciding whether to waive, permanently suspend, or uphold the area’s existing glass rule as it pertains to the Symphony project. The HCDA, which has delayed making a final decision on the issue three times, has set a decision-making hearing for Sept. 16 at 1 p.m.
Symphony will include commercial space on its lower floors, including an automobile showroom for JN Automotive Group. San Diego-based developer OliverMcMillan, which began construction on its Symphony Honolulu luxury condominium project in late 2013, has sold 90 percent of the units in this project, which is expected to be completed in less than a year, the firm’s CEO said this week. The project, being developed on 3.35 acres at 888 Kapiolani Blvd. across from the Blaisdell Center, includes 388 units in a 45-story tower, with commercial space on lower floors, including an automobile showroom for JN Automotive Group. Dene Oliver, CEO of OliverMcMillan, the keynote speaker of the International Council of Shopping Centers Hawaii event in Waikiki, said that he plans to own and live in a unit at Symphony Honolulu. He also has lived in a unit at another OliverMcMillian project, Pacifica condominium in Honolulu. The firm has recently opened a Hawaii regional office in Downtown Honolulu at Bishop Square’s Pauahi Tower. It also has offices in Atlanta, Houston and a showroom in New York. Alan Ong, former chief operating officer of Hunt Development Group’s Hawaii Division, has recently joined OliverMcMillan as its regional manager of its Hawaii operations. When asked by PBN about new projects the firm is working on, Ong declined to specify. The developer, through its former Hawaii regional manager, previously told PBN that it is eyeing several other projects in Hawaii. OliverMcMillan has been chosen to develop a nearly 27-acre parcel in Kapolei in West Oahu into a 400-unit mixed-use residential project. Ong, who was in attendance at the ICSC event, told PBN that it is working on the planning and design of this project. OliverMcMillan, the San Diego-based firm developing the Symphony Honolulu condominium project, is opening a Hawaii regional office next month and is in negotiations for two new development projects in the Islands outside of Honolulu, the head of the company’s Hawaii office told PBN. One of the projects is a condominium and the other a mixed-use urban village, according to Serge Krivatsy, managing director of OliverMcMillan’s Hawaii office. The firm also is looking at developing projects in Kapolei and on the Neighbor Islands, he said. “We’re looking at stuff in town and in Kapolei,” he said. Krivatsy told PBN that the firm is eyeing three to four deals, with one or two being a condo project and another a potential apartment complex for renters. 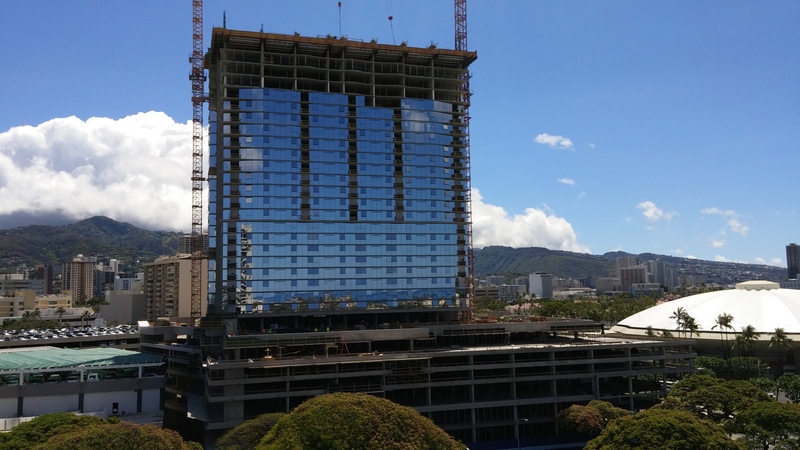 OliverMcMillan, which acquired and completed the Pacifica condominium in Honolulu, the former Moana Vista project, several years ago, is opening its Hawaii regional office at Bishop Square’s Pauahi Tower in Downtown Honolulu. It also has offices in Atlanta and Houston and a showroom in New York. 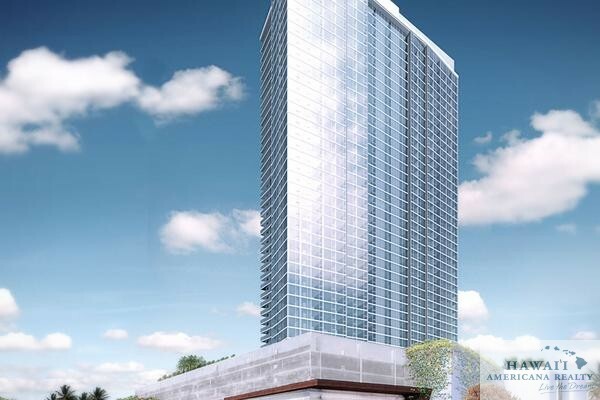 OliverMcMillan Pacific Rim LLC has put 10 penthouses at its 388-unit 45-story Symphony Honoulu condo project on the market with prices that start at $1.56 million. The company said Wednesday that the largest the penthouses at 888 Kapiolani Boulevard is 2,053 square feet. All of the penthouses have floor-to-ceiling windows, and some have 10-foot ceilings. They also have white oak flooring, kitchens with Thermador applicances, stone and marble bathrooms and ocean views, the company said. OliverMcMillian broke ground last year on the project, which should be ready by 2016. It is 75 percent sold, the company said. OliverMcMillan, in partnership with JN Automotive Group, will offer residents a car service called Velocity Premier Auto Concierge, which will allow them to use cars such as Ferrari, Maserati and Lamborghini. 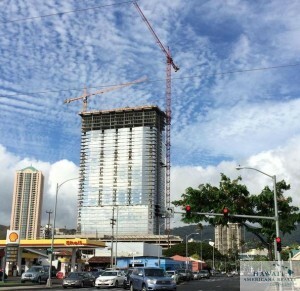 OliverMcMillan Pacific Rim LLC began construction Wednesday on its 388-unit, 45-story Symphony Honolulu mixed-use condominium tower at the corner of Kapiolani Boulevard and Ward Avenue, across from the Neal S. Blaisdell Center in Honolulu’s Kakaako neighborhood. More than 150 people attended a groundbreaking ceremony for the project, which is located on 3.35 acres at 888 Kapiolani Blvd. Earlier this month, the developer said that First Hawaiian Bank is the lead bank among four lenders on a $120 million construction loan for the project. Other lenders included Central Pacific Bank, American Savings Bank and the Washington Capital Joint Master Trust Mortgage income fund. The condo tower will include market-rate and reserved residential units, as well as commercial space on the lower floors, including an automobile showroom for JN Automotive Group. San Diego-based OliverMcMillan expects construction of Symphony Honolulu to take about 25 months to complete. About 70 percent of the available units were sold within the first two days of sales, which began in June.